With control over microemulsion formation you can extract lots of oil via EOR, create cosmetics microemulsions and even make rational nanoparticles. The first app is basically the Solubility app from the Basics, at the bottom you can find an app relevant to nanoparticle creation. Oil trapped underground once its initial pressure has subsided can be pushed out by pumping in water. Unfortunately the water tends to punch holes through the oil, creating channels where essentially pure water flows, leaving the oil sitting there doing nothing. The only way to force them to mix is to ensure that the interfacial energy is close to zero - in other words to have HLD=0. 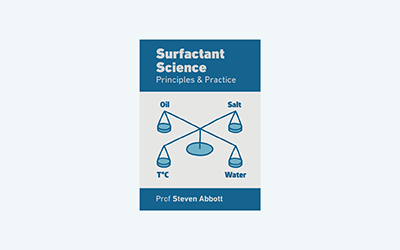 If all oil wells were the same then one surfactant would do the job the world over. But oils are very complex and can have very different EACN values depending, for example, on their levels of asphaltenes. The wells are at different depths so the rocks are at different temperatures. And the salinity of the water passing through the well can vary strongly. Under the tough conditions of an oil well (the surfactant can be underground for months) the surfactant has to be stable and must not react with the rocks. Finally, although the oil can fetch a high price, costs of extraction are significant so if too much of an expensive surfactant is required EOR is not viable. Therefore it is crucial to obtain the greatest oil solubility for the least surfactant. The only way the EOR industry has been able to advance is by using HLD. As has been observed in theory and tested in practice, the same science applies to soil remediation. If the EACN of the contaminant in a soil is known then water plus the right surfactant can be pumped through the soil to push the contaminant to a collecting station. the A (Head Area), L (Tail Length) and ξ parameters. These are crucial to the efficiency of the surfactant. Bigger head area increases efficiency. The tail length has an interesting effect on how the solubility falls off as you go away from HLD=0. Of special interest in EOR are the so-called Extended Surfactants which have high ξ parameters which make them more efficient. ξ is built in to the NAC part of theory. Basically it describes the distance over which a set of surfactant molecules act as one. Think of them as straight-line segments of a polygon. The longer the length of each segment, the bigger the size of the polygon they create - so the bigger the drops of oil that can be contained in the emulsion. See the ξ discussion under NAC which points out that it is not a constant but decreases with the size of the oil - one reason that it is hard to find a good surfactant for large oil molecules. To optimize for EOR, enter the EACN of your oil and the temperature and salinity of the oil well. Adjust Cc till the HLD=0. Now tune the other surfactant parameters (or put in estimates for the various types of surfactants you are considering) till the required ml/100ml of oil is obtained. It is unlikely that any single surfactant will give you exactly what you want. But once you know the ideal Cc value, you can use the Cc blending calculator in the Essentials section to find a good balance. The same model is directly applicable to cosmetic microemulsions. For an efficient Type III, set the temperature to 25°C and the salinity to the low value typically used in cosmetics. Then find the Cc that gives HLD=0. If you need an o/w microemulsion then you need to be in the area with a small negative HLD and if you want w/o go to a small positive HLD. One key consideration about cosmetic microemulsions is their temperature stability during transport and storage. The temperature effects of ethoxylates are 6x larger than of ionics and many of the sugar-based surfactants have essentially zero temperature effect, so it is likely that for temperature stability you will gravitate towards sugar-based formulations unless you want some special heat-shock effect in which case an ethoxylate will be excellent. As with EOR, it is unlikely that any single surfactant will give you exactly what you want. But once you know the ideal Cc value, you can use the Cc blending calculator in the Essentials section to find a good balance. Of particular interest to cosmetic microemulsions is their ability to be "dilutable" without passing through some horrid high viscosity phase. The Phase Diagram Explorer allows you to visualise what happens when you (or perhaps your customer) travel a dilution path through phase diagram space. Take a w/o microemulsion of, say, barium chloride and mix it with a w/o microemulsion of, say, sodium sulfate, the two react to create nanoparticles of insoluble BaSO4. This is an excellent way to create highly stabilised (lots of surfactant shell!) very small (a few nm) nanoparticles with surprisingly little effort - provided you can used HLD-NAC to get into the right Type I or Type II space. Similarly, you can start with a microemulsion containing an oxidised solution and add a reducing agent to the continuous phase to form a solid nanoparticle. To work out the size of your nanoparticle you can use the drop-size equation in the HLD-NAC section or the simple calculations here based on a Volume/Surface Area calculation (r=3V/SA) or a rule of thumb popularised by Prof Lopez-Quintella that r=A+BR where A and B are constants (1.5, 0.175 or 1.1 and 0.22) and R is the molar concentration ratio of Water/Surfactant for a w/o microemulsion. The difference between the LQ and VS values may be explained if the LQ radius includes the "shell" provided by they (typically) 1nm surfactant. 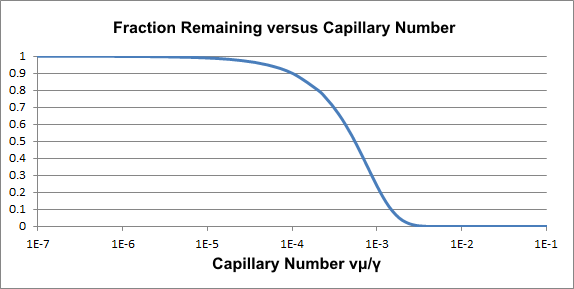 The key equation involves the Capillary Number Nc=vμ/γ where v is the (Darcy) velocity of the water/oil through the oil well, μ is the viscosity of the water and γ is the interfacial tension. There is typically a critical value of Nc at around 10^-4 below which most of the oil stays behind. With enormous effort and cost for pumping one can increase v by, say, 1 order of magnitude or by adding polymers can increase μ, but by reducing interfacial tension by a factor of 100 you get much more oil for much less effort. So getting close to the HLD=0 sweet spot makes a big difference in extracting more oil.